On October 13th, “Grace for President” was opened by Raleigh Little Theatre at the North Carolina Museum of History. The opening night event included book sales by Read With Me, one of the event’s sponsors, a “Grace” inspired gallery hunt in the museum, a photo booth, button making and a panel discussion lead by First Lady Kristin Cooper, First Lady of North Carolina. 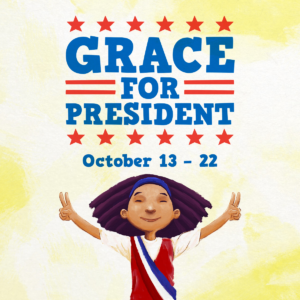 Originally written as a children’s book by Kelly DiPucchio and illustrated by LeUyen Pham, “Grace for President” is about a young girl who is confused by and fed up with the fact that there have been no female presidents. Her exclamation of “Where are the girls?” sparks a fun and informative election for third grade class president. The play “Grace for President,” directed by Judy M. Dove and sponsored by BlueCross BlueShield of North Carolina, adds musical flair to Grace’s journey and invites the audience to be part of the story. The lyrics and music, written by Joan Cushing, incorporate many different styles of music, from ballads to hip hop, making sure there’s something for everyone. I found myself clapping along with the seven year olds in front of me to the explanation of the electoral college, a sentence I never would have thought I’d say. Even without a child with me, I found myself thoroughly enjoying the play. Grace is a realistic, inquisitive, intelligent and kind-hearted kid, which makes her relatable to audiences of all ages. Jessica Jones, who brought her daughters to the play, found an unexpected connection she and her girls enjoyed. “I didn’t know any of the ages of the cast, but the fact that they’re middle schoolers, teenagers, and the fact that one of the cast is a home schooler, because we’re homeschoolers, that was really special,” Jones said. 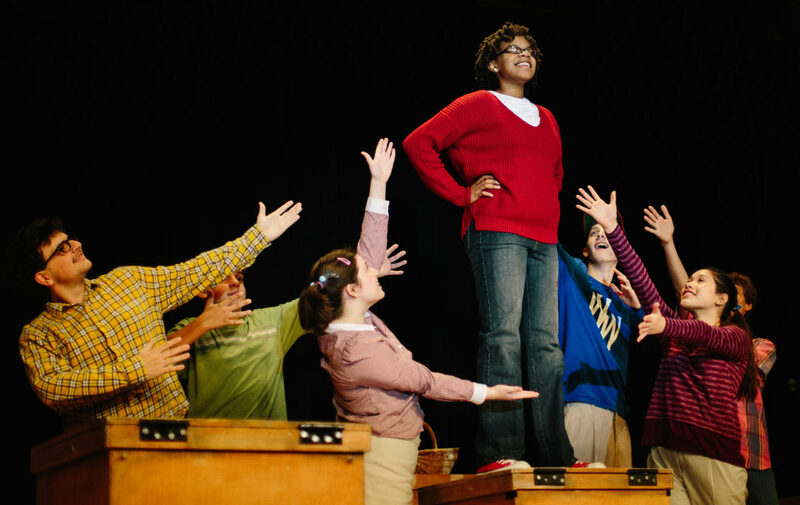 Grace Campbell is wonderfully portrayed by TaMya Bland, who attends Athens Drive Magnet High School. Bland learned of the role while working as a camp counselor for the Justice Theatre Project’s summer camp. She was told by a good friend that the director was looking for more females to try out for the part of Grace. After an audition and two weeks of anticipation, the role was hers. Bland talked about the preparation process, and how she had to evaluate the character in order to portray her. It came down to one simple thing: “[Grace] knows what she wants, and she goes after it,” Bland said. The panel discussion following the event was held on stage and mediated by First Lady Cooper. The panelists, girls in leadership roles from schools around the triangle, answered questions about how to apply what they learned and how they thought Grace could have done things differently. They offered the kids in attendance the chance to think more critically about the character’s actions. While the panel section did go right over some of the younger audience member’s heads, I saw more than one child nodding in agreement, or turning to a parent to add to the discussion. You might be wondering why you’re reading this review in a college paper. The fact of the matter is, it takes a village to raise the children, and our community is our village. Am I suggesting you and all your college friends go see this play based on a book for six year olds? Maybe not. But I am saying that if you have children, siblings, cousins, neighbors or any child in your life, Grace is a wonderful character for them to be exposed to early on. Grace isn’t just a child concerned with politics, and let’s be honest, many adults aren’t as passionate as this kid was about politics. She’s someone who saw a problem and did something about it. That’s the true beauty of both the book and the play; Grace is a positive role model that children can easily identify with, especially children in the black community. While Grace’s race is never mentioned in the play or the book, it is undeniable that she is a child of color determined to make a change in the world, and that is the kind of attitude all children of color need to see. The play will continue at the North Carolina Museum of History until October 22. For a list of show times and ticket prices, visit raleighlittletheatre.org/shows/grace-for-president/. And if you and your sibling, cousin, or the bald-headed kid you babysit on the weekends, can’t make it, the book is available pretty much everywhere. I bought one for my little sister, and even though she’s four and can’t read yet, I’m determined that the image of this little brown girl with the word “President” stretched above her head is something my little sister will see, know and believe.